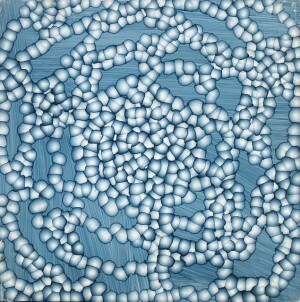 Ross Bleckner was born on May 12, 1949, in New York and grew up in the prosperous town of Hewlett Harbor on Long Island. The first art exhibition he saw—The Responsive Eye, a show of Op art on view at the Museum of Modern Art in New York in 1965—had a strong impact upon him. He decided to become an artist when he was in college, studying with Sol LeWitt and Chuck Close at New York University, where he earned a B.A. in 1971. Two years later, he completed an M.F.A. at the California Institute of the Arts in Valencia, where he met David Salle. 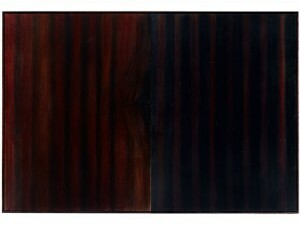 After moving back to New York, Bleckner purchased and moved into a Tribeca loft building in 1974. Painter Julian Schnabel rented out three floors of the building, and the Mudd Club, a nightclub frequented by musicians and artists, occupied space there from 1977 to 1983. (Bleckner sold the building in 2004.) Bleckner's first solo exhibition was held in 1975 at Cunningham Ward Gallery in New York. In 1979, he began his long association with Mary Boone Gallery in New York, which championed several of the so-called art stars of the 1980s. In 1981, Bleckner met Thomas Ammann, an important Swiss dealer who went on to collect his work. Bleckner's early 1980s Stripe paintings, which pay homage to the work of Bridget Riley, were not particularly well received by critics. His atmospheric Weather series (1983) followed. In 1984, Bleckner's art attracted a burst of attention when he had a single large painting on view at Nature Morte in the East Village. Around this time, he was painting canvases he viewed as memorials, in which candelabras, vases, chandeliers, and rococo motifs seem to float against dark grounds. This imagery was in part a response to the AIDS crisis. Later paintings also manifest his sense of loss stemming from the disease. Some paintings, such as 8,122+ as of January 1986 (1986), bear titles reflecting the number who had died of AIDS to date; others are commemorative works dedicated to individuals; still others employ patterns of dots to suggest the lesions produced by AIDS-related sarcomas. In the following years, Bleckner commenced his Constellation paintings (1987–93), suggestive of night skies, and the Architecture of the Sky canvases (1988–93), which call to mind domed interiors. In the early 1990s, he made his first Cell paintings, which make reference to diseased human cells. From that time, he has continued to paint apects of the body viewed at the microscopic level, including forms related to DNA and cancer cells, the latter in response to his father's unsuccessful battle with the disease. He has also created a series of bird paintings (1995–2003) and experimented with varied surfaces as well as the use of an airbrush. In 1993, Bleckner bought a property formerly belonging to Truman Capote in Sagaponack, Long Island. Bleckner's first solo museum exhibition was organized by the San Francisco Museum of Modern Art in 1988. His work has since been the subject of numerous solo exhibitions, including a midcareer retrospective organized by the Solomon R. Guggenheim Museum in 1995. 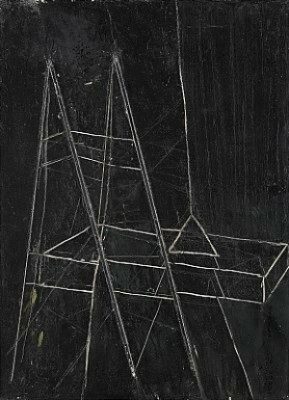 He has been represented in many group exhibitions devoted to abstraction, among other themes, as well as the Whitney Biennial (1975, 1987, and 1989), Biennale of Sydney (1988), and Carnegie International (1988). He continues to live and work in New York and Sagaponack.